I was invited to a gathering in Washington DC in 2015 where we were going to meet with Nadia Murad. My heart was beating with sorrow, excitement, and did not know how to encounter “someone like her”. I was not sure what I would say to her. I was thinking to give her a big hug, a one that she could feel as supportive and in solidarity. But I did not know if I could ever look at her eyes. We arrived at the gathering and felt ‘lucky’ when we were told that she was not coming, she was so tired and sick from traveling and so could not make it to the gathering. I was relieved. Then I saw her story appeared on the news media, social media and suddenly Nadia Murad became a public figure giving testimonies to the US congress, talking to press and giving speeches at the UN assembly. A Yazidi friend in the US once told me that ‘they’ are using her, referring to the politicians, ‘she needs psychological treatment, she is going to die by telling her stories’. Is it really what that friend told me, are these testimonies eventually kill Nadia and add more on to her suffering and trauma? The documentary “On Her Shoulders” will have answers to that. 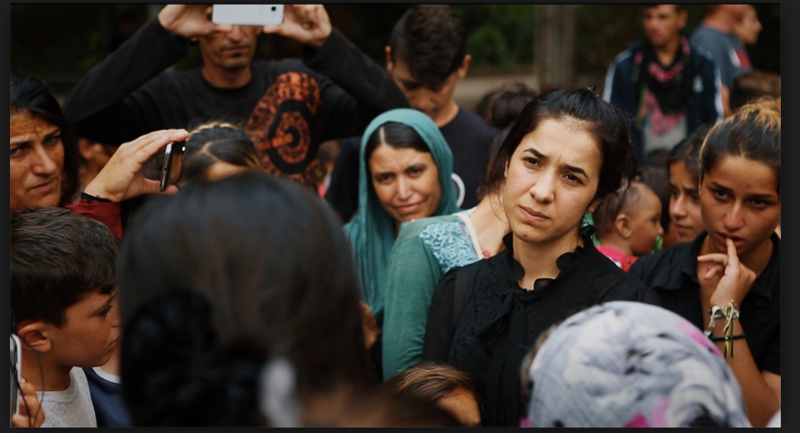 “On Her Shoulders” is a documentary film by director Alexandria Bombach featuring Yazidi Activist and the recent Nobel Prize co-winner Nadia Murad. The narration is in English, Nadia Murad speaks in Kurdish with English sub-titles. She only speaks Arabic when addressing the UN and some Parliaments. The documentary focuses on her activism in the West. One scene contrasts the Iraq, Yazidis, Kurds with the garden that surrounds the magnificent Canadian Parliament where the performance of changing the guard of Canadian soldiers with music for an audience takes place. She says if that was in Iraq, an ISIS militant would already have blown himself up. Her reaction to that scenery is priceless and reminiscent for everyone familiar with conflict zones. The serenity in the West versus the chaos in the Middle East. This is also a metaphor of her life in the village of Koco before and after ISIS. The documentary helps the audience to understand the tremendous efforts she has to go through in order to make her cause visible and urge world leaders to take action. I am surprised and also sickened by the rehearsals she practiced for addressing the UN Assembly and other gatherings. I asked myself, why on earth does she need to endure all of this? Yet, nothing comes easy. To make yourself heard and have your suffering recognized, you need to resist until you succeed. The documentary fills the audience with the feeling of what more could be done? In the documentary Nadia Murad visits countries and meets with lawmakers and heads of statesto tell them about what happened to herself, her family, and her people on August 3rd2014 when ISIS besieged their village Koco.ISIS murdered the men and elderly as well as abducted women and girls like Nadia herself.There are still thousands of Yazidi women missing. One would expect to watch a traumatic story, which is indeed itself, yet the resilience of Nadia is one thing sticks out the most and her dedication. To come out publicly as a survivor of ISIS atrocities and becoming an activist requires strength that Nadia has. One can see her confusion over identifying herself as an activist, refugee and survivor at the very beginning. She is also surrounded by other Yazidi people such as Murad Ismael, the director of Yazda Organization,that gives strength to Nadia in her struggle and she appreciates having such good people in her life. Telling a traumatic story is difficult itself, however the director chooses not to ask her to tell what happened to her, it is us the readers should know it. Listening to a trauma also requires action, most of the time, as Shoshana Felman puts it, the listener would ‘suspend knowledge’, would not want to hear the traumatic story because listening is to take responsibility. We see that Nadia Murad has to tell her story on and on in several radio and TV interviews. The journalists apologize for asking her these questions. In one scene, a Canadian parliamentarian meets Nadia Murad after testifying before the Canadian Parliament and tells her that she would like to give her a Canadian leaf as a gift at the moment until they themselves come up with some solutions to help the Yazidi refugees. Through out the documentary, she seems to lost in thought. One can give it to the trauma she goes through, but it is beyond that. It is the silence and slow actions of the international community when these kinds of atrocities take place. I left the movie theater with the appreciation and admiration one more time for Nadia Murad, for speaking up and for her perseverance despite all of this. Yet, one thing resonates after watching it that everything should not be on her shoulders, everyone should take responsibility. As Nadia Murad herself asks: if you do not act on this, when would you move and act?